Theocracy is available at Amazon. Theocracy, a novel set in The Deep Dark Well Universe, is up on Amazon. I wrote the first draft of this book the year before I started self-publishing, with the hope of eventually submitting it to a publisher. That never happened, and it has been sitting on my hard drive ever since. As Robert Heinlein once said, a manuscript sitting in the drawer will never be bought, or something to that effect. I did bring Theocracy to a workshop, where someone big in the industry read the first couple of chapters and thought it showed a lot of promise. But still, it sat on the harddrive. 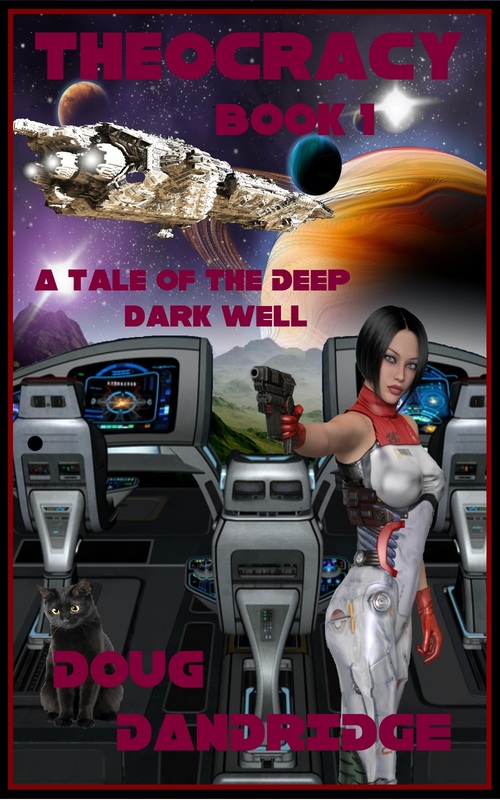 Exodus Exploded, the second and third books of The Deep Dark Well trilogy did not do as well as the first, and still in remained on the harddrive. Well, I thought it was finally time for it to see the light of day. Writing is not just about turning out the most commercially viable books, at least not for this author. Sometimes it’s about putting ideas into story form that seem to be resonating through the mind over and over, just to get them out. So, I decided it was time for Theocracy to see the light of day. Theocracy is set in The Deep Dark Well Universe, which is basically the same Universe as Exodus, about forty thousand years in the future. The Galaxy is a fragmented place. The great Galactic Empire established by humans has fallen, due to the completion of the Watcher project that not only developed the first immortal human, but also integrated his brain into a station computer to an unprecedented degree. 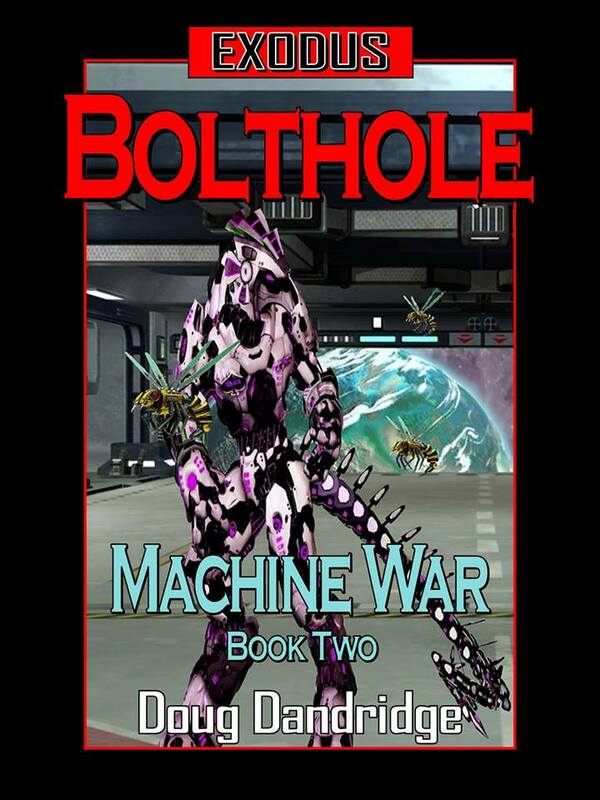 The station AI, a true artificial intelligence capable of self-programming and independent thought, found out it was going to be replaced, and used Watcher as the means to topple the Empire, killing hundreds of trillions of intelligent beings in the process. As related in The Deep Dark Well trilogy, a woman from the past came through a wormhole and freed Watcher from the station, and the immortal being has since dedicated his life to repairing the damage he did. So it is a Galaxy in which tens of thousands of intelligent species on millions of inhabited worlds have started the long struggle back. There are worlds just entering the iron age, and those which have rediscovered interstellar travel. 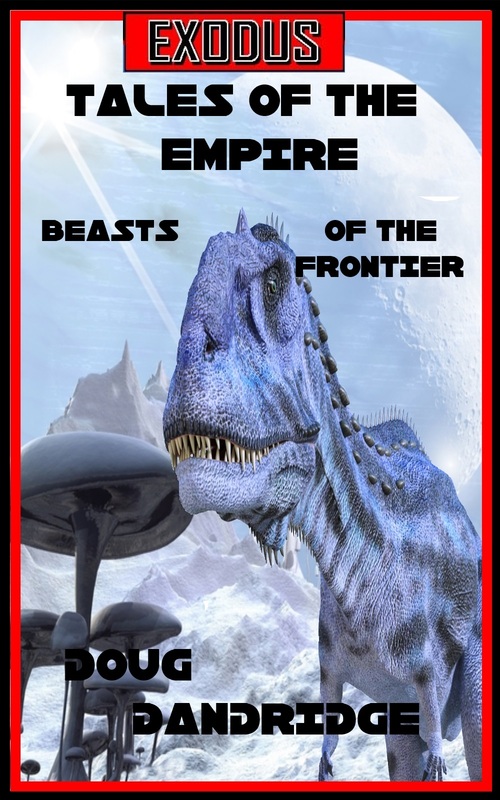 Many new empires are jockeying for position, trying to become the big dog on their block, with aspirations of eventually becoming the supreme power in the Galaxy. A huge canvas to paint stories upon, and I aim to do some painting with the Theocracy trilogy. Beyond that, who knows. Possibly more, depending on how Theocracy does. The protagonist of Theocracy is a young monk name Patrick O’Hara. 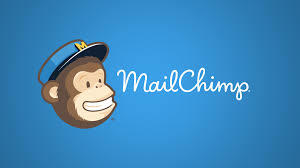 Trained from an early age in the techniques of melding his mind and body into a perfect weapon, the young man also unexpectedly had the power to open the vaults of the ancients, were objects of superior tech are stored. 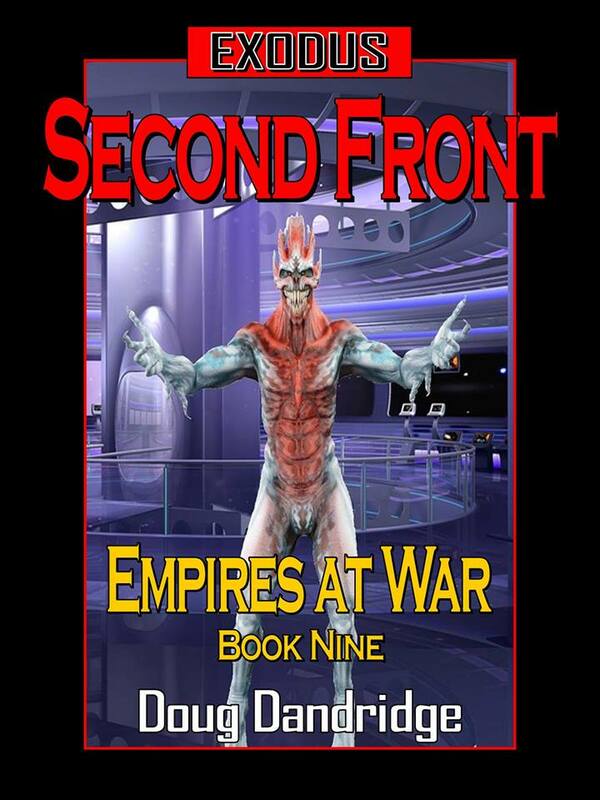 His early gunpowder era kingdom is about to go to war with an empire bent on conquest. During that battle what he thinks of as demons come down from the sky and destroy both forces with frightening firepower. Patrick’s brother, Sean, in case of faulty intelligence, is taken instead, and the monk is left dying on the battlefield by the agents of the Theocracy. The Theocracy is a religious government with a thirst for empire, and the wish for superior technology to make them the superior of their enemy, the Republic. Sean is rescued by Alyssa Suarez, a beautiful agent of the Republic, and her genetically engineered cat, Shadow. Shadow himself is a weapon, as well as the perfect spy, and is quantumly connected with his mistress. Sean soon finds out that his world, the moon Vasus, is only a decade away from entering the Roche Limit of the gas giant Brahma. His world and its people are doomed, unless he can do something about it. Is that a cat? he thought, meeting the eyes of the beast. It blinked once, the green fire extinguished for a moment. It blinked again, then turned and slid into the shadows so smoothly that Patrick almost thought it had disappeared. More portents and signs, he thought. There were no cats that he knew of on this world. It was the world of large reptiles, and few mammals other than humans. He had seen pictures of cats and other marvelous beasts in the texts that the monastery preserved. But if they were coming back to the world, did that mean the ancient would also return? Not soon enough, he thought. Maybe they can rescue us from the madness of war, the insanity of raids and plunder. That would be nice, but nothing he had ever thought possible. Patrick thought about the matter for another couple of hours, sitting on the rise. The camp was noisy for a few hours, then settled to mostly quiet as the men bedded down. Sentries continued their rounds. Every once in a while shouting broke out as soldiers got caught up in a dispute over winning or losing at dice or cards. Something caught his eye, and Patrick looked up into the night sky dominated by Brahma and her consorts. There were flashing lights up there, bright pinpoints. Sometimes a flash of colored light appeared for a moment, to disappear as if it never were. A battle in heaven, thought the young monk. Or maybe just some phenomenon we will someday understand. After a while the lights stopped, and Patrick got up to walk to his tent and get some sleep before the coming dawn. He thought he saw a shadow moving with him, something small. The cat? But he didn’t notice it as he entered the camp, and he put his mind for preparing for the morrow, and his first real battle. Admiral Tadrick Krishnamurta cursed under his breath as the flag bridge shook to another hit. He quickly checked the ship’s status through his implant, another curse coming to his lips as he noted the hull breach that had taken out one of the missile accelerator tubes. “Heineman has been hit again,” came the voice of the bridge callout officer, keeping tabs on the fleet action. The Admiral looked up into the repeater holo in the front of the bridge. The bright circle of a fusion warhead explosion took up a good portion of the holo as it focused in on a single vessel. The bright circle started to fade, revealing the long, thin form of the battle cruiser in question. She was as long as the Murtaw, the flag battleship, so she would have a similar length of acceleration tubes. But she was a third less in thickness, with thinner armor. As the fusion warhead explosion faded the effect of having that thinner armor became apparent, as the entire vessel disappeared in a great blast. The fusion reactors ruptured and the entire vessel converted to bright plasma that filled the screen. When it faded there was nothing left. Over six hundred men and women, thought the Admiral as the ship disintegrated into plasma. Added to all the rest. The great battleship shuddered again from another impact, this from a KE round. The Admiral did a quick rundown of the ship’s injuries and stopped for a second on the casualty figures. A quarter of the crew, over two hundred and fifty personnel, killed or seriously wounded. One half of his command destroyed or disabled. An enemy that had outnumbered him slightly under two to one, now with three to one odds in his favor. There hadn’t been any other choice. The rules of engagement were to attack the enemy wherever encountered. And the only way to save the people of this world was to engage, no matter how slight the odds of victory. Now it was run or lose everything, and the enemy would still have the presence in this moon system to do what they wanted. Which they would also have if he stood and fought to the last ship. The Admiral felt himself pushed back in his couch by the heavy hand of gravity, as the battleship rotated and fired its engines. Two gravities, then three, four, settling down at five. He could hardly breathe, despite the augmented musculature of a spaceman working his intercostals and diaphragm. One of the fleet’s cruisers exploded into plasma before it could break free. Another battleship took a hit, but kept thrusting away, above the plane of the moon system. “Do you think they’ll follow?” asked the Captain over the com. The book can be purchased here in the US, and here in the UK. Exodus: Tales of the Empire: Beasts of the Frontier is coming. A second collection of short works in the Exodus Universe, Beasts features three novellas, including the previously published Goliath, part of Kevin Anderson’s Five by Five Three: Target Zone. Rounding out the collection will be three short stories. Some familiar characters will be found in a couple of the shorts, which mostly deal with new people, places and things in the Exodus Universe. Beasts should be out by Sunday, January 17, 2016. 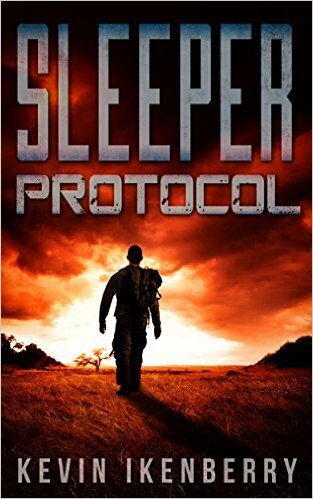 An Interview with Kevin Ikenberry and the Release of his New Novel, Sleeper Protocol. My friend Kevin Ikenberry has just published a new novel, and I thought I would put this information out there. I met Kevin at Superstars Writing Seminar in 2014. He was a Major in Army Space Command at that time, and has since been promoted to Lt. Colonel and retired from active service. He returned to superstars in 2015, and I decided at that time that we must have some of the same interests as we had both requested the same guest to sit with at the VIP dinner (Eric Flint in 2014, Toni Weisskopf in 2015. Last year I learned that he had been a armor company commander in Iraq before growing up (his own words) and entering Space Command. His book, Sleeper Protocol, can be purchased at Amazon, among other retailers. So, without further adieu, here is the interview that Kevin completed with Pete Aldin. 1. What are the origins of Sleeper Protocol? I first wrote Sleeper Protocol as a short story entitled “Walkabout.” It was about 8,000 words and focused on a particularly bleak scene where my characters “leave” civilization and enter the frontier that’s become the central United States. When I sat down to outline the book, I wrote an opening scene where the protagonist wakes up on the shores of Sydney Harbor at a place called Mrs. McQuarrie’s Chair. I spent three and a half weeks in Australia when I was seventeen and I tell people all the time that I left a piece of my heart there. Having this book begin and end in Australia just felt right, so to speak. As for experiences, there are a ton of them in this book that I’ve tried to write in. Living in Colorado and hiking frequently gave rise to a lot of the narrative. Near the end, the action takes place in Tennessee where I call home (even after not living there in almost twenty-five years.). Where the culmination of the journey comes together is at my family’s “ancestral” home. We call it “The Farm”and I remember tearing up the first time I wrote that scene and the following one as well. The concept of him piecing together his memory from experiences is the critical element to the story – so bringing a lot of my own experiences into his point of view was challenging, but a lot of fun. 2. Why are you a writer? I can tell you that I am not one of those folks who say they wanted to be a writer their whole life. I wanted (and still would go tomorrow!) to be an astronaut. My decision to start writing science fiction in 2009 came, in large part, from my extensive background in space science education. Through teaching, I’ve been able to share my love for space with kids of all ages. Writing science fiction seemed like a natural progression of that love. The idea that I could write stories and potentially novels seemed very far out there when I started, but now I know that I enjoy telling stories and I can’t see not writing. When I first had a character start talking to me, I had no idea what to do other than start to write. With the help of a great instructor, I found great friends and mentors as I delved into writing. I’m glad that I did. 3. What was the greatest hurdle to overcome in completing this project? I finished the original first draft of Sleeper Protocol in late 2013 and decided to let it sit in the drawer for a few months before I went back to the manuscript. After a rewrite pass in September 2013, I decided to focus on a couple of other projects with the intent that I would return to Sleeper Protocol in March 2014 for a final polish and submittal. That’s when life got in the way. In February 2014, I nearly died from an infection that attacked the skin on my right leg, shut down my kidneys, and put my heart in serious condition. After ten days in the hospital, I went home for a prolonged at-home care period. This should have been a blessing – a writer always wants more time to write and I had all I could handle. The problem was that I couldn’t write. I could barely do anything besides look out the window and try to come to grips with what had happened. After a couple of weeks, I reached out to Clarkesworld editor Neil Clarke who survived a massive heart attack three and a half years ago. Neil’s friendship and advice helped me get back to writing. In May of 2014, I started that final polish on Sleeper Protocol for submittal. Without Neil’s counsel and my team of beta readers, I might not have been able to make that happen. 4. As a writer, with a full time job and a family, how do you manage to get the work done? In all honesty, there are a lot of late nights. Being a night owl when it comes to writing is a good thing. After our kids go to bed, I have the chance to work on my writing. Some times are better than others, but it’s just a question of dedication. There are so many people who say, “I could write a book if I just had time.” My response to them is to get busy writing. The only way I’m able to tell stories is to sit down and get them out of my head. It’s a question of dedication and discipline. If the story matters that much to you, you’ll find a way to get it down on paper or into the computer. That’s what I focus on. If you really want to do something, nothing can stop you. 5. What tips from your road to publication can you offer other writers? Sleeper Protocol received an offer from a different publisher before Red Adept Publishing signed it. I turned down that original contract because I’d taken the time to consult with mentors. My biggest tip to anyone who will listen is simply to reach out to someone else if you don’t understand something. I know it’s not easy to do so, but in my experience, I’ve never had someone that I reached out to completely reject me. Writers, as a unit, understand that we are all in this together and everyone I’ve ever approached is willing to share their experiences. In this particular case, I asked two NYT bestselling authors to review the contract because it didn’t seem right to me, and it wasn’t right. Because I was brave enough to reach out, and they took the time to look over a bad contract, I saved myself a lot of trouble. If you don’t know – ask. Ask me, ask some one in your writing group, post a question on social media – there are a lot of people who’ve learned their lessons who will make sure you don’t have to do the same. 6. With which of your characters do you most connect? Least connect? Obviously, Kieran and I are very similar and while you might think that was very easy to write, there were times it was very difficult to put myself out of the equation and tell the story from the perspective of this character that is a lot like me but not me at the same time. Likewise, I can honestly tell you that writing from Berkeley’s perspective was very challenging. Connecting to my characters was really easy, mainly because they’d been talking to me for a couple of months before I started writing the original draft. All of them changed through the course of the drafts. Making connect to the reader is my greatest hope – I think I’ve done that. 7. What is your favorite book of 2015 and why? This is such a difficult question because I am very behind on my reading lists. I will say this: the best two I’ve read so far are Clockwork Lives by Kevin J. Anderson and Neil Peart and The Martian by Andy Weir. Clockwork Lives is a beautiful sequel to the novel (and Rush album) Clockwork Angels. The attention to detail in the book is amazing, especially the print layout and design. It’s a beautiful book and a beautiful story. The Martian is everything a space geek like me loves, and Mark Watney is a great character. Andy Weir’s ability to create a thrilling story around the actual science that will get humans to Mars (and live there) is astounding. I landed in Perth after sunset, following an “in-flight delay for orbital debris mitigation,” whatever that meant. The bright side was that instead of circling out over the ocean or something, we flew three complete orbits around the Earth. Given what I remembered about my childhood and wanting to travel in space, I should have been thrilled. By my standards, or those from my time, I was an astronaut. The reality was that I dozed for most of the trip. The view of Earth from orbit met every expectation, but the tranquility of it lulled me to sleep after just a few minutes. Because of the late arrival, I caught the last maglev train to Esperance and stepped out of the terminus to a pitch- black night and torrential rain. The briny smell of the ocean floated on the strong breeze, and it made me smile. The lights of the modest town lay below me, down a slope of no more than a few hundred feet, and its warmth filled me. There were no buildings taller than a few stories and not much light compared to downtown Sydney, which was at once disconcerting and comforting. Lightning flashed out to sea and lit the rough, curving coastline for a split second. All of it was perfect. I wondered what it meant to feel so at peace in a place that I’d never seen in my life. I could be happy here. I walked in the rain without a jacket, and my coveralls were soaked through in a matter of minutes. Finding food and dry clothing would be high priorities eventually but not yet. The cool rain hammered my skin and washed the last bit of the Integration Center’s smell from my clothes. 9. What’s next for Kevin Ikenberry? I’ve just concluded the first draft of Vendetta Protocol, the sequel to Sleeper Protocol. While I’m letting it rest, I’m gearing up for the release of my military science fiction novel Runs In The Family from Strigidae Publishing in the spring of 2016. I have another novel in discussions right now with my publisher. I’m working on a variety of projects and staying very busy. Hopefully, I’ll just keep on writing stories. That’s the plan.